Whether you’re a target shooter, competitive archer, or hunter, you’ve probably given some thought to setting up your own backyard archery range by now. Some prefer an indoor range because it is convenient and the designated place can consist of their basement or garage; others want to do the same in the great outdoors. Indoor ranges are easy to set up because you won’t have to check with your local regulations and find out whether or not doing so in the proximity of your home may be prohibited by any municipality laws. However, using a bow in a room might give you less satisfaction than practicing in your backyard. You should always be cautious when shooting outdoors. Even in those moments when you know for sure that there’s nobody else around, you ought to stay behind the firing line and keep tabs on everything that might be on the move, be it an animal, or in a worst case scenario, a neighbor who has decided to pay you a visit. To avoid any mishaps concerning safety, you may have to figure out a way of catching your arrows. Whether you intend to use a regular wooden fence or create one from straw bales, the fact is that it can let you avoid a lot of trouble in the long run. Making sure that you have marked your firing line can help you determine your accuracy and distance, and that’s why it may be a good idea to use some rope or paint a line on the grass. This practice is particularly important if you’re only starting out with using an archery or hunting bow and have hardly had any chance to practice with it. After you’ve set up your firing line and an emergency backstop, you can continue with posting your targets. Ideally, you should start with a single target to get a clear picture of the distance required for you to shoot your bow both correctly and comfortably. The minimum distance for a single target is about ten yards, and while this might seem too close if you’re a beginner, it’s a good starting point. Once you have mastered the art close-range shooting, you can place the target farther and test out your abilities. The golden rule to keep in mind, in this case, is to maintain realistic expectations and understand that practice makes perfect. A field point target is incredibly easy to build if you have some lumber available and a bit of time on your hands. A piece of carpet can also come in handy. However, it should be pointed out that such a target cannot and should not be used for broadheads. Broadhead targets are different in that they need to put up with the abuse of your arrows and also allow you to pull them out conveniently. In this case, building your own might be significantly more challenging than it would if you were to make a field point target; that’s why you may have to purchase one for the purpose, especially as most all-purpose models are priced around thirty to forty dollars. 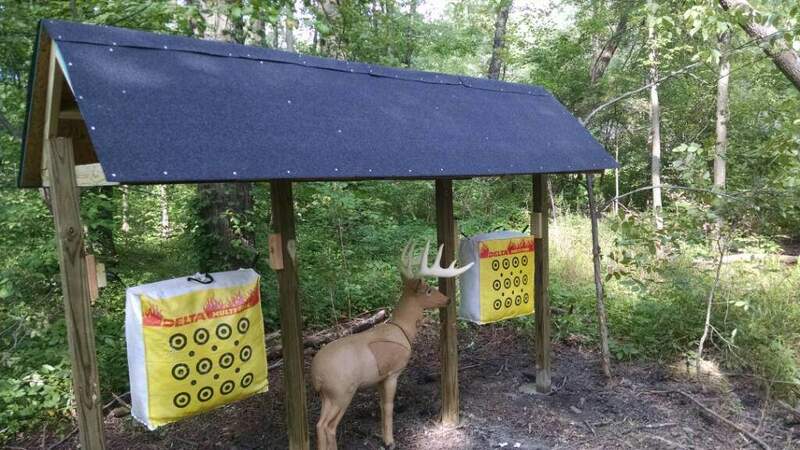 3D targets offer excellent results for practice especially as most have been designed to withstand moisture, the sun, and high temperatures. Premade field target balls can be used for broadheads, as well, so you may have to bear them in mind. Making a DIY bow stand from some PVC pipe is easy, and there are innumerable online resources that can help you achieve this goal. If you can’t be bothered with constructing one all by yourself, you ought to start prospecting the market for a stable one that’s durable and easy to use for your skill levels. Luckily, most bow stands available for sale aren’t particularly expensive, and they are made from sturdy materials, so you won’t have to worry about anything. Once you have gone through all these steps, you can safely simulate several hunting situations. After all, the whole point of setting up an archery range in your backyard is to practice as you would under a real-life hunting circumstance. The needs of archers and hunters are different, so take the time to assess them and understand whether you plan to aim at a living target from a stand as you may have to do the same when practicing in your backyard. One thing’s for sure. Becoming proficient is far easier if you have something to practice with.